Delphine Chanéac (born 14 November 1978) is a French model, actress and disc jockey. She was born in Valence, France. Chanéac worked in the French cinema, appearing in European films and television in the late 1990s and 2000s. 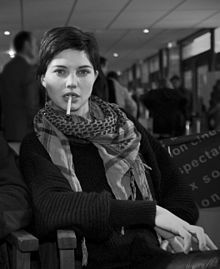 She is best known for her role as Pauline in the French sitcom La Vie Devant Nous and for portraying the genetic hybrid Dren in the Canadian science fiction/horror movie Splice. She actually shaved her head for the role. She also starred in the crime thriller Verso. Chanéac, Delphine (2007). La nuit, mon père me parle. Neuilly-sur-Seine: Lafon. ISBN 978-2-7499-0596-9. Chanéac, Delphine (2010). Ce qu'il reste de moi. Lafon. ISBN 978-2-8098-0234-4. ^ a b "Baby Dren is Monstrously Adorable in the New 'Splice'". Fangoria. Retrieved 13 May 2010. ^ Florino, Rick. "Playlist Adrien Brody and Delphine Chaneac of 'Splice' — 'To quiet the beast, you give her some nice classical music and jazz'". Artistdirect. ^ http://www.nbcdfw.com/blogs/popcornbiz/How-the-Splice-Creature-Lost-Her-Hair-95627434.html . Retrieved 12 August 2017. ^ Cammila Albertson, "Delphine Chanéac", All Movie Guide. Wikimedia Commons has media related to Delphine Chanéac. This page was last edited on 29 June 2018, at 14:51 (UTC).